We took these high definition photos while within the courtyard of The Louvre called the Cour Napoleon, and this is one of the stone statues located on the Aile en retour Turgot, which is dedicated to Pascal. 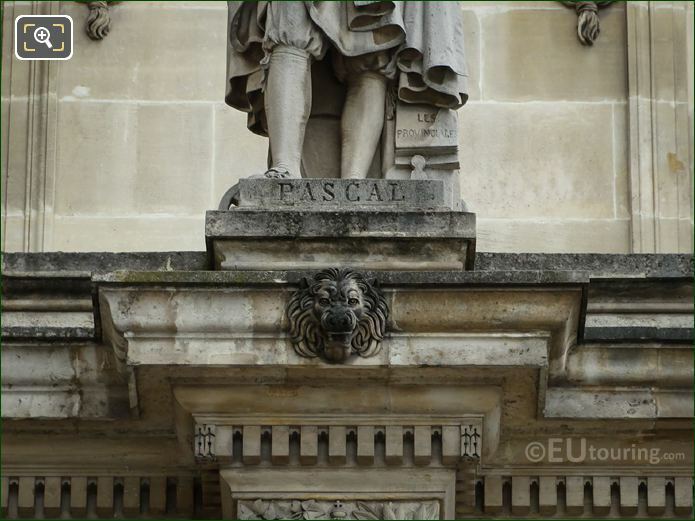 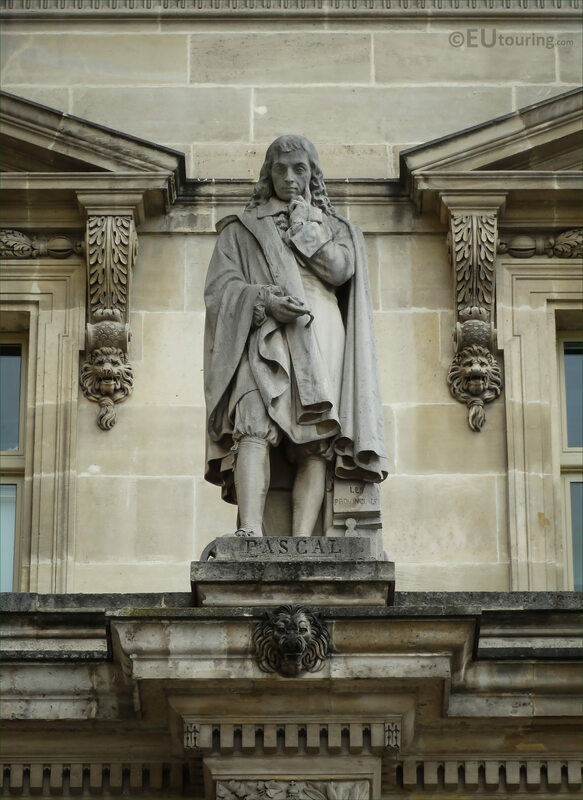 In this first image you can see the statue of Blaise Pascal by Francois Lanno, which is located on the first floor balustrade in between the windows, and as you are looking at the facade of the Aile en Retour Turgot, this is positioned second from the left. 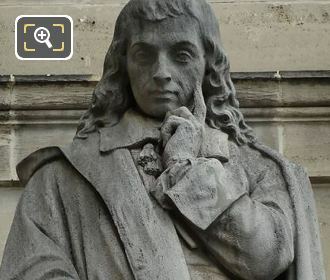 So, this photo shows a close up of the statue of Blaise Pascal who was a mathematician, physicist and inventor, becoming famous for his mechanical calculator, and this statue was produced by the French sculptor Francois Gaspard Aime Lanno who was born in 1800 in Rennes and passed away in 1871 having produced several monumental statues in stone. 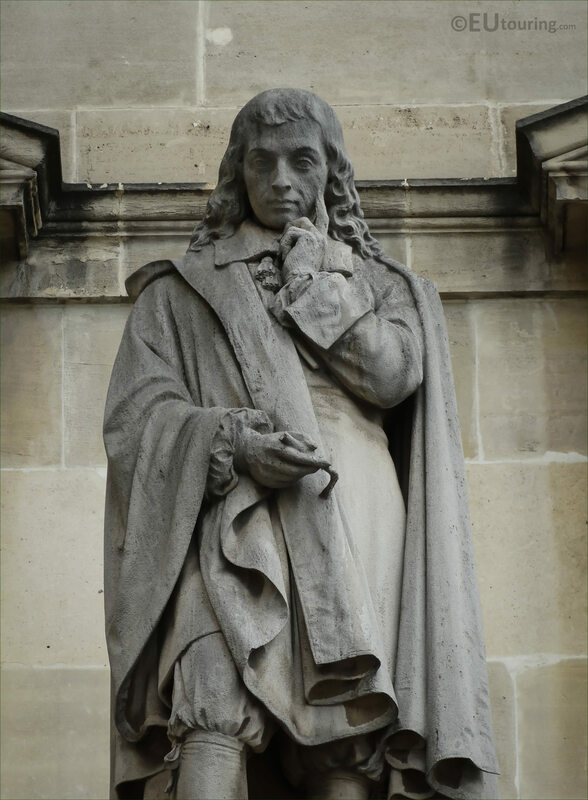 But getting back to Blaise Pascal, which is the name you can see on the base of the statue in this photograph, you will find that he was born in 1623 and while still a teenager, he started working on producing a calculating machine to help his father, and called the Pascal's calculators he was one of the first two inventors of the mechanical calculator, yet he also worked in the fields of the study of hydrodynamics and came up with inventions including the hydraulic press and the syringe.